Happy St.Valentine's Day! I have already been celebrating. First I washed my hair with pink shampoo. It is Passion-Fruit Smoothie! My favorite brand, V8. Did I say V8? I must have thinking of the tomato, or love apple. I meant V05. Followed by pink conditioner, Strawberries and Cream. My breakfast included apples, the food of love. Next I listened to one of the most romantic Chopin waltzes, played by my favorite pianist, Pennario. What a beautiful comment someone left on that video! "Ex-aequo avec Mr. Dinu Lipatti." That means "The equal of Mr. Dinu Lipatti." Dinu Lipatti's Chopin waltzes are also exquisite. Howard got up and wished me Happy Valentine's Day. While he was enjoying his oatmeal and newspapers I caught up on my St. Valentine knowledge. You can tell from his name that Valentine was Roman. That is a marvelous Roman-sounding name. Our story today is full of wonderful names! Valentine was a Roman priest and he was martyred during the reign of an emperor with a marvelous name, Claudius the Goth. Valentine was apparently marrying Christian couples in secret in defiance of Claudius. The emperor apparently took a liking to him -- I am reading from the site I linked to above -- but Valentine tried to convert the Emperor, which the site says was "a tactical error." Even saints are not perfect! Valentine was stoned and beaten with clubs and finally beheaded, around 269 A.D., outside the Flaminian Gate. It always strikes me how these details come down through the ages as a reminder that these figures from the distant past are real. There is a story about St. Valentine that has come down through the ages. When he was imprisoned, the jailer had a blind daughter. Before he was killed, Valentine sent a note to the daughter and her sight was restored. The note was signed, "From your Valentine." Above is a painting of the event by an artist with a marvelous name. 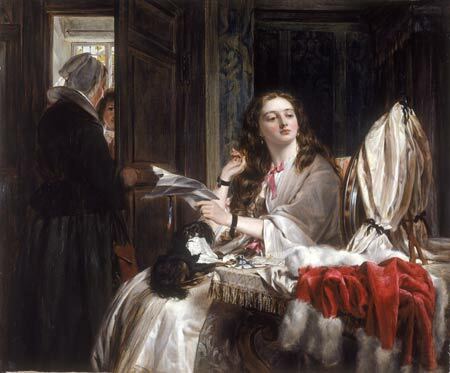 It is John Calcott Horsley! St. Valentine's feast day was established in 496. It is Feb. 14 because that was the day he was martyred -- or buried, depending on what account you read. It was the day before an old pagan Roman feast honoring Juno Februa, or Juno the Chaste, which was linked to love. I guess that settles the question of where "February" comes from. Or "Feb-yoo-ary" as we say here in Buffalo. Good St. Valentine is the patron saint of a spectacular array of things: engaged couples, happy marriages, love and lovers, young people, greetings, bee keepers, epilepsy, fainting, plague and travelers. How about that? When you travel, you may pray not only to St. Christopher, you may pray to St. Valentine. 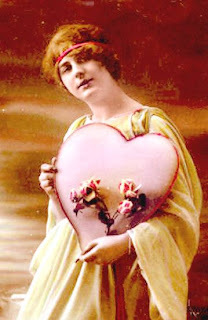 Here is a marvelous old St. Valentine's Day postcard from around 1910. 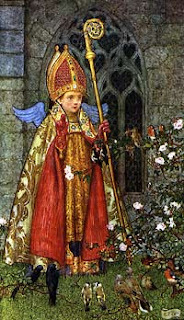 St. Valentine himself is often pictured with birds and roses, as he is in this picture from this sweet Web site I found. Look at the birds paired off in front of him! Chaucer wrote in "The Canterbury Tales" about how Valentine helped birds find mates. And now I am off to my Monday.